Two beaching events of the calycophoran siphonophore Abylopsis tetragona (Otto, 1823) were observed in two different areas of the Strait of Gibraltar during the cold season. The first was discovered on November 2014, on Getares Beach (Algeciras Bay, Mediterranean part of the Strait of Gibraltar), where more than 700 colonies were found deposited along the tideline. The second event was discovered on January 2015, on Paloma Baja Beach (Tarifa, Atlantic part of the Strait of Gibraltar) where an average density of 170 colonies m−2 was spread along the seashore. Both events seemed to be promoted by strong easterly winds, preceded by upwelling episodes that may have concentrated high densities of the siphonophore in superficial layers. This study represents the first report of a calycophoran siphonophore mass stranding. The records were made thanks to citizen science and jellyfish outreach at secondary schools (PERSEUS@school initiative), illustrating the importance of citizen science projects in observing natural phenomena. 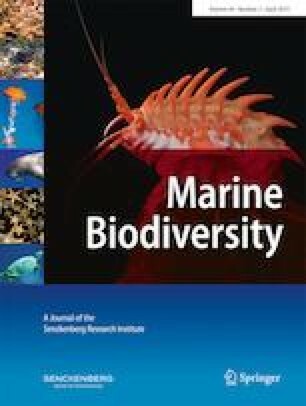 We consider the monitoring and recording of cnidarian stranding events especially important in highly productive and biologically active areas such as the Strait of Gibraltar. Special thanks to the students of first bachelor of the school María Auxiliadora (Algeciras): Beatriz Escobar, Irene Tirado, Paola Cuellar, Mario Mena, Quique Laza, Víctor Hernández, Daniel Jaén, Eduardo Conde and Pedro Martínez, and the students of 4° high-school of the same school: Cristina Martínez Pérez, Aurelio Sánchez Alfonso, Alejandro Pérez Romero and Manuel Jiménez González who informed about the second event. The students involved in the project won two first national prizes in two different young researchers competitions (April and June, 2015) and were finalists in the international Science on Stage competition (Hungary, July 2017) for their developed jellyfish research project. Thanks to Dr. G. Mapstone for encouraging this work and her valuable comments on the manuscript. KK, LP and GN were funded by PERSEUS European Project (FP7-287600). KK was also funded by the Rotary Club Genève Lac, Switzerland. This article does not contain studies with live animals performed by any of the authors. All necessary permits for sampling and observational field studies have been obtained by the authors from the competent authorities and are mentioned in the acknowledgements, if applicable. The study is compliant with CBD and Nagoya protocols.